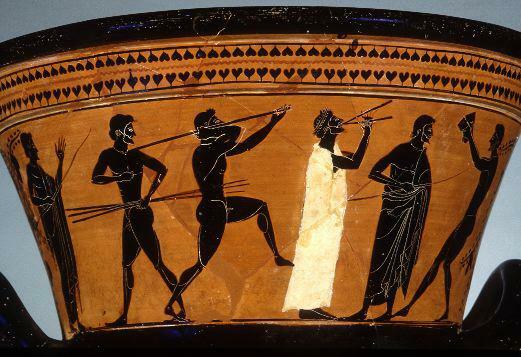 Ancient athletes competed as individuals, not on national teams, as in the modern Games. The emphasis on individual athletic achievement through public competition was related to the Greek ideal of excellence, called arete. Aristocratic men who attained this ideal, through their outstanding words or deeds, won permanent glory and fame. Those who failed to measure up to this code feared public shame and disgrace. Not all athletes lived up to this code of excellence. Those who were discovered cheating were fined, and the money was used to make bronze statues of Zeus, which were erected on the road to the stadium. The statues were inscribed with messages describing the offenses, warning others not to cheat, reminding athletes that victory was won by skill and not by money, and emphasizing the Olympic spirit of piety toward the gods and fair competition. 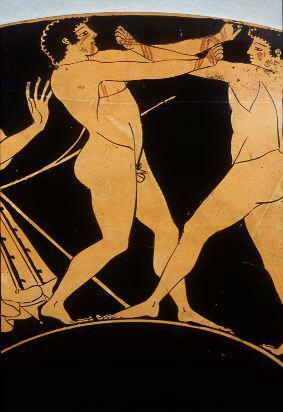 The earliest recorded cheater was Eupolus of Thessaly, who bribed boxers in the 98th Olympiad. Callippus of Athens bought off his competitors in the pentathlon during the 112th festival. Two Egyptian boxers, Didas and Sarapammon, were fined for fixing the outcome of their match at the 226th Olympics. All these men were immortalized as cheaters in the writer Pausanias' 2nd century A.D. guidebook to Greece, in which he describes the statues at Olympia and recounts the men's misdeeds.